Some rapprochement will be necessary between Web 2.0 – the social web – system and the current “hierarchical, substantially introvert, guarded, careful, precise and measured” tertiary system if higher education is to continue to provide a learning experience that is recognised as stimulating, challenging and relevant. This is a conclusion reached by the recently published (May 12, 2009) wide-ranging British Report of an independent Committee of Inquiry into the impact on higher education of students’ widespread use of Web 2.0 technologies. The committee was chaired by Professor Sir David Melville (pictured) former Vice Chancellor of the University of Kent and the current chair of LLUK (Lifelong Learning UK) Council and of the JISC-funded Committee of Inquiry into the Changing Learner Experience. Noting that Web 2.0 has had a profound effect on behaviours, particularly those of today’s young people, “Higher Education in a Web 2.0 world” (PDF here) says in contrast to the current university norms the social web has led young people to a strong sense of communities of interest linked in their own web spaces, and to a disposition to share and participate. It has also led them to impatience – a preference for quick answers – and to a casual approach to evaluating information and attributing it and also to copyright and legal constraints. “The two worlds are currently co-existing, with present-day students effectively occupying a position on the cusp of change,” the report said. “They aren’t demanding different approaches; rather they are making such adaptations as are necessary for the time it takes to gain their qualifications. “Effectively, they are managing a disjuncture, and the situation is feeding the natural inertia of any established system. to continue to provide a learning experience that is recognised as stimulating, challenging and relevant. It would also come, the report said, from policy imperatives in relation to skills development, specifically development of employability skills. These would be backed by employer demands and include a range of ‘soft skills’ such as networking, teamwork, collaboration and self-direction, which were among those fostered by students’ engagement with Social Web technologies. I’m indebted to SLED lister, Dr Bob Hallawell, of Academic Lead Learning Disabilities,School of Nursing, Midwifery and Physiotherapy, at the University of Nottingham, for the heads-up on this interesting report. Education Guardian comment here and UK Web Focus report here. Does body language matter in virtual worlds? I often find it interesting how real world etiquette and sometimes body language carries across into virtual worlds, such as Second Life, from the real world. I believe one can determine another person’s/avatar’s sense of immersion or commitment to a virtual world by watching his or her behaviour in a virtual world. Because I feel my avatar “lives” in virtual worlds his use of etiquette and body language, as limited as that may be, often follows that of his real life master – the person sitting in real life behind the keyboard. I would not say that is true of all my avatars but it is at least true of my main avatar. Some of my “alts” are just plain contrary. I listen to voice in SL from the point-of-view of my avatar rather than my SL camera but I still focus on who is talking in a meeting. I look at people in the meeting, as I would in real life, rather than gazing around the venue or using my camera to search the surrounding countryside, rooms or buildings. It is as though I am in the meeting with those other avatars and pay attention to them in the same way as I would in real life. 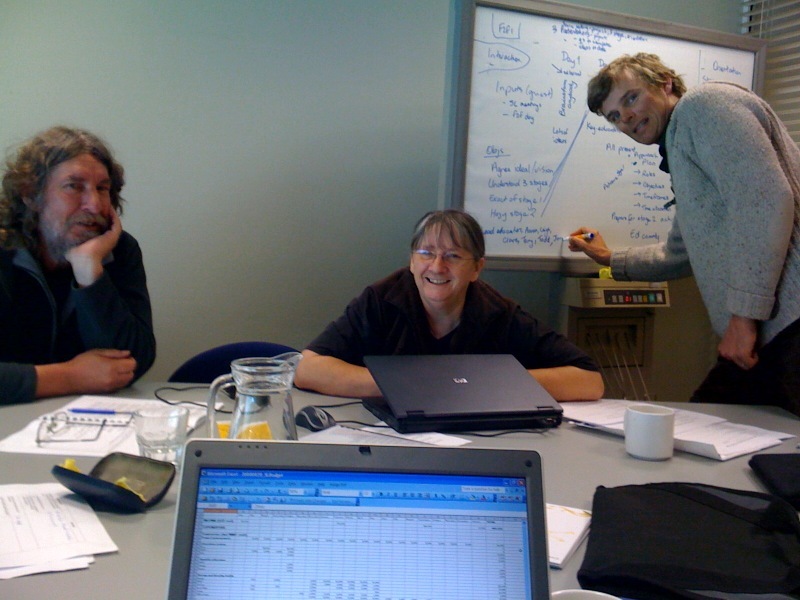 In fact, if an avatar in a meeting of avatars, or for that matter in a virtual world classroom situation, is not “paying attention” to the class – in other words “lurking” – I would suspect that he or she is not fully immersed in the learning programme, and probably should really be teaching face-to-face, or via a telephone hookup, videolink, groups text messaging or another non virtual world technique, such as snail mail. This was brought to mind for me recently when a lead avatar who normally makes a lot of sense in world, walked into a meeting and then stood for the whole meeting with his back to the other participants who were sitting down, despite the fact that he was talking and had important material to convey to the meeting. He is a person who “speaks” about being fully immersed in the virtual world among other things. For me his body language spoke more loudly – and gave the lie to his claim of full immersion in virtual worlds. Of course, it may have not been the same for other participants. And it might have been that his computer was not up to the job of “moving” his avatar into a sit position. But if it wasn’t important that the other avatars could see that he was talking to them what was the necessity for holding the meeting/class virtually. Its all about the thing others have defined as “presence”. It’s that thing we call “presence” that theoretically makes MUVEs valuable for both the conference and the learning environment. It’s “presence” that researchers and educators claim makes the difference in learning outcomes – the presence of both the educators/facilitators and the students and the sense of really being there. Few claim that anyone gets that sense of being there in videolinks or phone hookups, or instant messaging. To me, rightly or wrongly, it seemed that that the person behind the screen of that avatar who was turned away from his fellow participants in the meeting I attended had no sense of immersion in the process, no sense of being the avatar, and so no sense of being there. Being in the virtual world served no additional purpose for him – and it was probably unnecessary for him to be there, virtually. He could have just as easily got his point across in an MSN group text message or any other text-based channel, such as a blog. The opposite problem is created by students/participants who turn up at a class or meeting “naked”, or turn somersaults/jump around and generally carry on while others are attempting to learn or hold a discussion in world. Then their “presence” becomes very apparent and also is disruptive for both the facilitator and the rest of SL group. This is especially so if the teacher/facilitator/educator does not have the SL/RL skills to curb the disruptor. These are often educators who say they “believe” in virtual worlds, but who don’t bother to get fully trained and comfortable with the medium, don’t have avatars and clothing that show they care about the medium, and don’t have equipment and headsets that work effectively in virtual worlds. 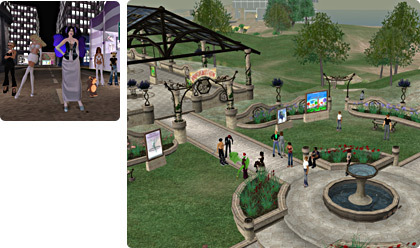 Show me an educator or educational institution that doesn’t have these prerequisites for “living” in-world and I will show you an educator or educational institution that doesn’t really believe in virtual worlds as a learning tool and is setting out to prove that they will fail to have any learning benefits. The question is, if you are an education researcher or soon-to- be educator in virtual worlds, besides having adequate and effective equipment, are you ready to take on the commitment of being a “real” avatar or do you want to just play around the edges for the sake of the money, the self agrandisment or because its the vogue thing to do? Collins, Project Manager, UC Second Life, Second Life Ambassador, Ohio Learning Network, UCit Instructional & Research Computing, University of Cincinnati, notes that the quiz is a first draft, and would appreciate feedback. “It’s not meant to be an exhaustive test of competency, of course, but more in the spirit of those “personality tests” that give you a sense of where you fall on a spectrum,” she said. Colllins is a big fan of the Global Kids Second Life Curriculum (and Jeremy Kemp who hosts it on Simteach.com), which she told SLED listers, she used as a guide to make the quiz. “It’s (Simteach.com) a good place to start for faculty who want to increase their own skill level or plan exercises for students ( http://simteach.com/wiki/index.php?title=GKCx/Table_of_Contents)” she concluded. I’ve seen the future of virtual worlds and already want to walk the streets. Well not really, but if Ray Kurzweil’s timeline (http://en.wikipedia.org/wiki/Ray_Kurzweil)(http://www.kurzweilai.net/meme/frame.html?main=/articles/art0274.html)is right Bruce Branit might be providing us with a glimpse into a future virtual world that is just over the horizon in this stunning and evocative video, “World Builder”. 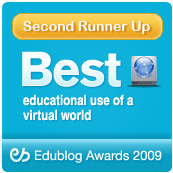 It’s not really grassroots education in Second Life or other virtual worlds but I think you will be pleased that you spent nine minutes watching it. As Not Possible In Real Life founder (Madly, wildly embracing the impossible made possible in Virtual Worlds) SL’s Bettina Tizzy (pictured) agrees this is what “Second Life should be like – and sometimes is” (http://npirl.blogspot.com/2009/03/this-is-what-second-life-should-be-like.html) I’m grateful for her heads up to something I found rather astounding … although only a video.